SPIRITUAL BEGGARS — the Swedish band featuring ARCH ENEMY guitarist Michael Amott and bassist Sharlee D'Angelo, along with vocalist Apollo Papathanasio (ex-FIREWIND) — will release its ninth studio album, titled "Sunrise To Sundown", on March 18 in Europe and March 25 in North America via InsideOut Music. 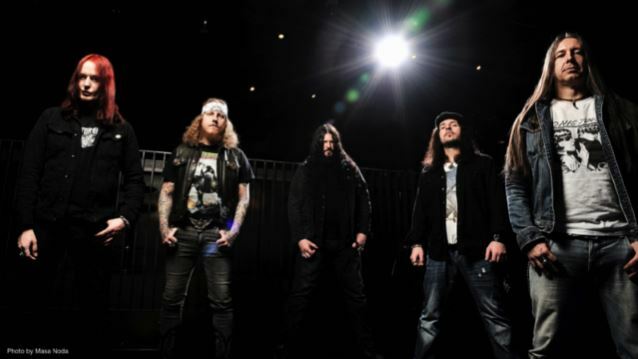 Just like on their previous two album releases, "Return To Zero" (2010) and "Earth Blues" (2013), SPIRITUAL BEGGARS' stellar lineup is is rounded out by Per Wiberg (CANDLEMASS, ex-OPETH) on keyboards and Ludwig Witt (GRAND MAGUS, FIREBIRD) on drums. After a busy couple of last years with ARCH ENEMY, Michael Amott and his bandmates have once again found the availability and inspiration to lay down eleven dynamic and uplifting new songs, which not only easily demonstrate how much on top of their game SPIRITUAL BEGGARS still are after over twenty years of activities, but also add a fresh and spontaneous vibe to their impressive catalogue. Speaking about how the new album came together, Amott said: "We've been writing the album here and there over the last couple of years when our schedules have allowed us to meet up and spend a few days jamming. A few of the songs I wrote on my own; others were written by our keyboard player Per Wiberg. Our drummer Ludwig Witt submitted two tracks that are actually his first major contributions to the band as a writer — and they're great songs too! I also co-wrote a few tunes with Per Wiberg and that was really a lot of fun as well, it's been a very collaborative process." In contrast to the often-soulless current high-tech digital cut-paste recordings, "Sunrise To Sundown" was tracked live off the floor. Amott said: "I'm super excited about how the album sounds sonically. Our engineer, Staffan Karlsson, also produced and mixed the album, and the result is something we're very proud of. "I think every album we have made (this being our ninth) has had its own vibe and atmosphere. I can honestly say this band has never made the same album twice. "To me, 'Sunrise To Sundown' is the next chapter of the book we've been writing since we started the band over twenty years ago. Of course, the foundation of our style is heavy rock music, but we always keep evolving adding new influences and colours to the bands core sound." SPIRITUAL BEGGARS will embark on a European tour in support of "Sunrise To Sundown" in March. SPIRITUAL BEGGARS reissued two of its classic catalog titles on October 14, 2013: the band's 2005 "Demons" album was made available for the first time ever on vinyl via InsideOut Music; and their acclaimed and hard-to-find debut LP, the self-titled "Spiritual Beggars" from 1994, was re-released with over 70 minutes of unreleased bonus material via Century Media Records.